Last week the investing world lost a giant. John “Jack” Bogle, founder of the Vanguard Group, passed away at the age of 89. He left behind a legacy that changed the way Main Street Americans invest and was never shy about speaking out against excessive Wall Street greed and reckless corporate management. In 2016, Bloomberg estimated that Bogle had saved investors more than $500 trillion in fees and trading costs since he founded Vanguard. In addition to re-inventing the way Americans save for retirement with his index fund, Bogle was always outspoken about shareholder rights, putting investors first, and out- of- control Wall Street greed. He railed against corporate CEO’s who make excessively more than their employees and managers who won’t disclose basic things like how the company is planning for climate change or spending its shareholders’ money to influence politics. Bogle went so far as to submit a public comment to the Securities and Exchange Commission (SEC) on the petition for a rulemaking asking the SEC to require corporations to disclose their political spending. He graciously shared his time with the Corporate Reform Coalition to talk about his belief that shareholders should be served first and that if they want disclosure, they should get it. 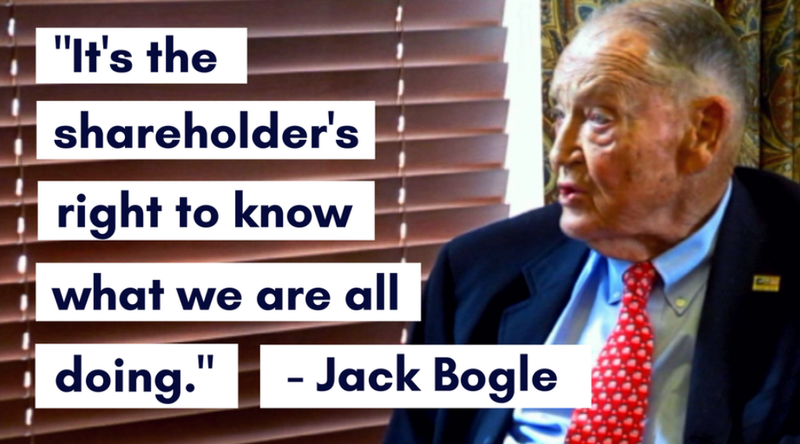 Jack Bogle’s wisdom, grit, and boldness will be greatly missed. You can read more about his life and work in the Philadelphia Enquirer and watch the interview he did with this coalition on corporate responsibility below. Our thoughts are with his family and friends at this time.